You've read about the popular Horizons curriculum, but like most homeschooling parents, you still want more information. No problem. Because Alpha Omega Publications understands your concerns in choosing the right curriculum for your child, we've designed a comprehensive outline—the Horizons Scope & Sequence. One quick glance will reassure you that Horizons is the right choice for your homeschool family. As you review detailed information about lesson content, you'll see for yourself exactly what your child will be learning in math, spelling and vocabulary, phonics and reading, penmanship, and more! But there's more! The teacher's guide information clearly shows how the teacher-friendly Horizons curriculum helps you achieve homeschooling success. Readiness evaluation tests, practice drills and worksheets, and a step-by-step teaching approach make Horizons so easy to teach, it practically teaches itself! Put your fears to rest in choosing the Horizons curriculum. 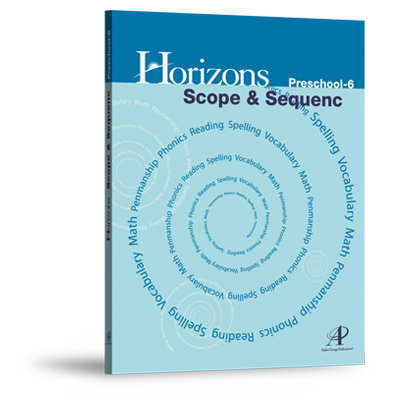 Add the Horizons Scope & Sequence to your shopping cart today!